Once a week I like to mix things up and make fun theme dinners like “seafood”, “Mexican”, "eat only with a spoon", or “breakfast for dinner” night. Breakfast has come to be one of my kids absolute favorite meals they look forward to after a long day of school and after school activities. A few recipes they love most those nights are Pumpkin Waffles, Crispy Fried Eggs, French Toast on a Stick and Crazy Healthy Smoothies. I try really hard at night to make sure the kids have a balanced meal with a protein, vegetable and carbohydrate on their plates. This can be challenging when you’re serving breakfast for dinner as the first meal of the day is generally more focused on fruits, carbs and protein. 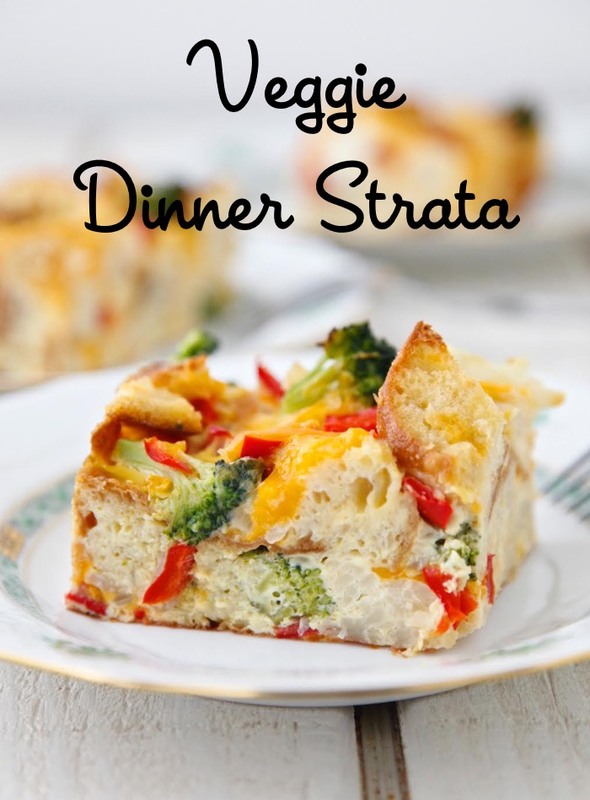 The kids love this strata made with lots of tasty sausage, so I worked up this Veggie Dinner Strata to serve on our breakfast for dinner nights. It’s a really economical dish yet it feels kind of fancy. The last time I made it I served it on fancy china to make it feel even more special alongside Fruit on the Bottom Tapioca for dessert. 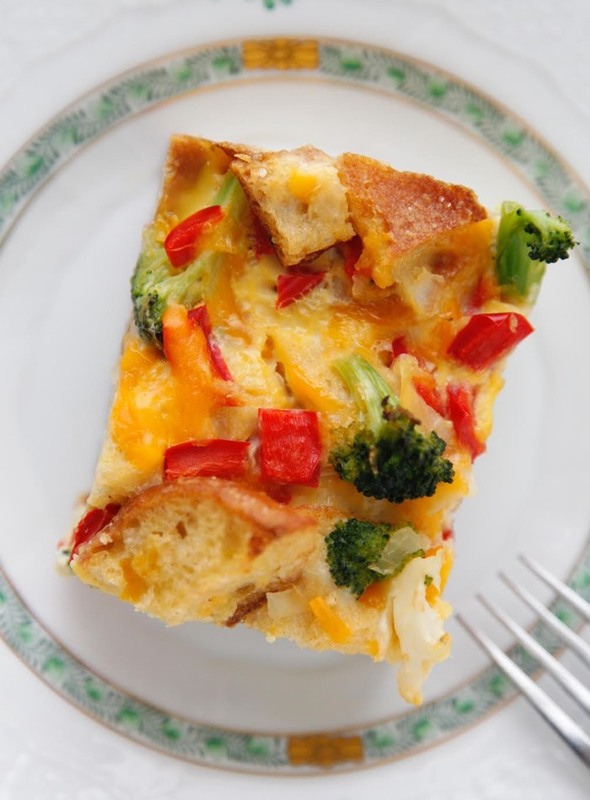 Since the dish makes eight plus servings it’s perfect for a crowd as well or even for breakfast leftovers another day. 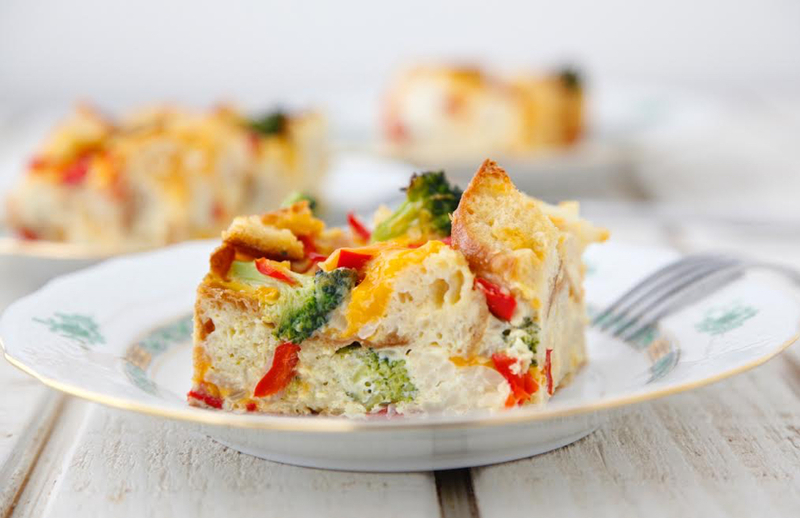 On this meatless Monday, make an easy dish that’s relatively light on your budget and your busy schedule by making this wholesome Veggie Dinner Strata! 2. Heat the oil in a large saute pan over medium heat. Add the onions and cook for 3 minutes. 3. Add the garlic, bell peppers, broccoli, cauliflower, and 1 teaspoon of the salt. Cook 5 more minutes, until the onions are soft. Allow to cool. 4. In a large bowl, beat the eggs, milk, the remaining 1 teaspoon of the salt and 2/3 cup of the cheese. 5. 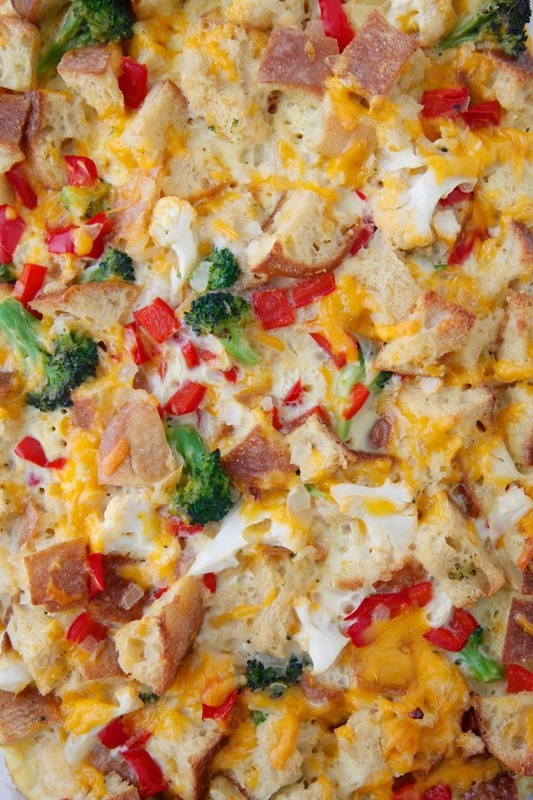 Grease a 13 x 9 baking dish, add the bread cubes and the cooked veggies, and toss to combine. 6. Pour the egg mixture into the baking dish, pressing down the bread mixture gently to soak up some of the eggs and sprinkle with the remaining 1/3 cup of cheese. 8. Remove the foil and continue to bake an additional 20 minutes. 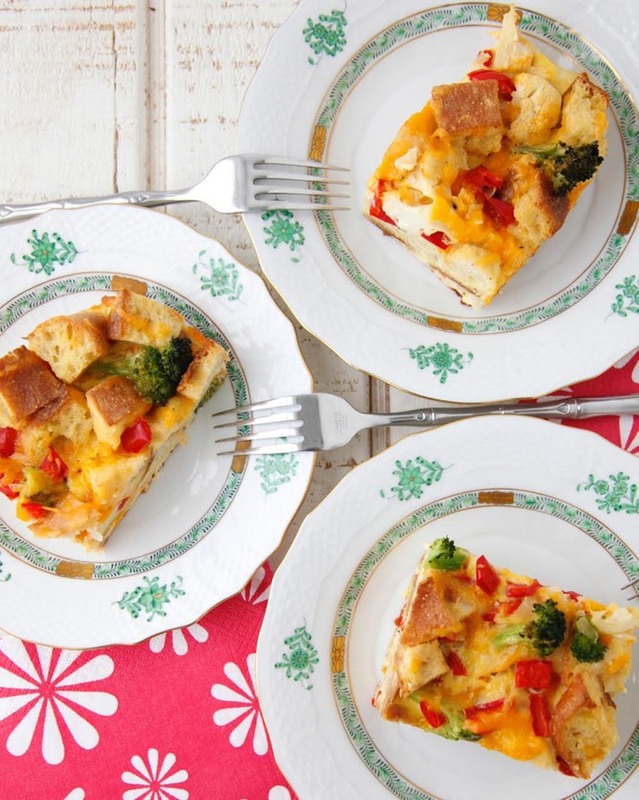 I'm excited to try this one and your Christmas strata. If I make both at the same time, can one be frozen and reheated at a later time? Yes. Freeze for up to 4 months. Bake from frozen, adding about 5-10 minutes to the cooking time. Can you prepare this earlier in the day, refrigerate, and then bake later? Yes! You could even prepare it the night before and leave it in the fridge overnight until you're ready to bake it!